The Guardians of the Galaxy blasted off this week into the mainstream. 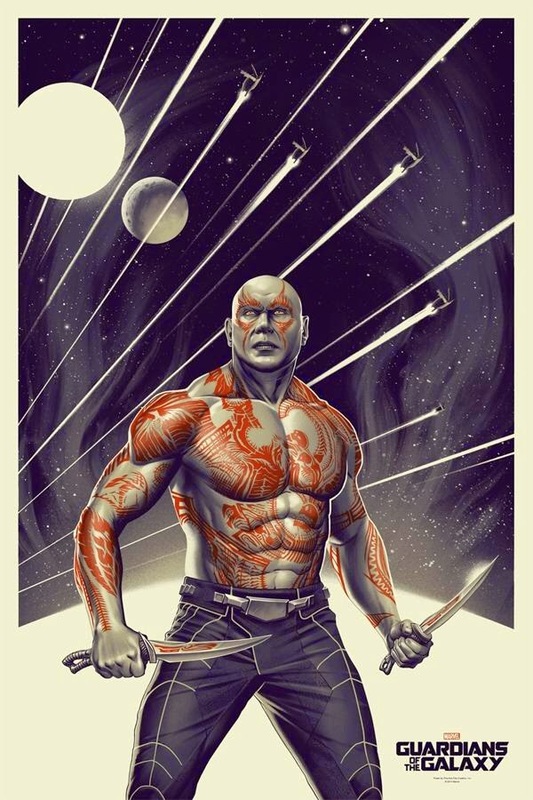 With a sequel already lit to their first outing before the debut was even on the big screen, its a great time for Mondo to be putting out a range of Guardians prints to own, done by such folk as Francesco Francavilla, Kevin Tong, Randy Ortiz, and Mike Mitchell among others. While I have to wait a few more days to see Rocket firing his bazooka sized cannons all over the show, these posters, including those below and an unposted Rocket and Groot 'Treehuggers' Mondo are also outta bounds to me and my walls, with all selling out in a matter of hours! Oh well, at least I can look at these slightly smaller jpegs and dream. Keep an eye on Mondo for future reprints from this here link. It's an incredibly funny movie. At the same time, they didn't cut out the weight of some of the issues. It's not as serious as the books, but then I think that was smart of them. The public wouldn't have been as enthusiastic about another dour superhero movie. And the lighter tone along with brilliant sight gags make it the perfect summer movie. But one with actual plot. I'm not surprised the merchandise is selling well, especially when it's beautiful all by itself. I especially love the Star Lord one. You'll enjoy the movie a whole lot, Dan. I hadn't laughed that much since I saw Bridesmaids. And before that, Twilight. Thanks Random - you are right I did love it. I don't think it has surprised anyone for me to say, I've been a little jaded on modern comics for a bit now. The humour, scope and heart of this film really had great timing in reminding me what I love about comics all over again. We went and saw it again. :). First time I've done that since I can't remember when. I still felt like clapping at the end. I think it would be a sign of the apocalypse if I didn't see it again this weekend too Random. I think the last comic film I did that for was the first Iron Man. Oh man, that was excellent in the theater. *sigh*. Memories.